La Virgen de El Panecillo from our hotel window. 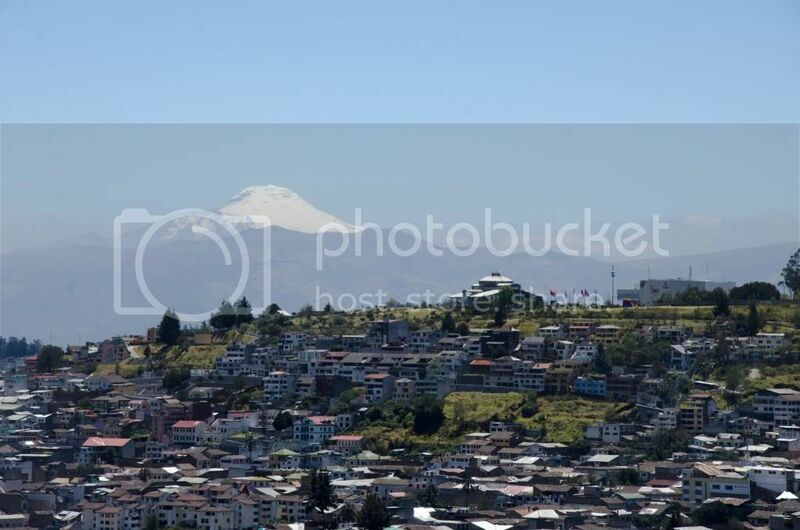 Just a few days before we moved into our new home here in Quito, we decided to visit a site we could see from our hotel window, El Panecillo. The hill was named by Spanish colonialists in the 16th century and it’s name comes from the word pan (bread) and the dimuntive ending illo (small). The hill literally looks like a small, country-style loaf of bread. Before the arrival of the Spaniards, the hill was already famous. The Inca may have used the hill as a place to worship the sun. Before the Inca, the Yavirac, a local indigenous tribe, used it as a reservoir for water. It seems that the hill has always been a place of importance to the local community. 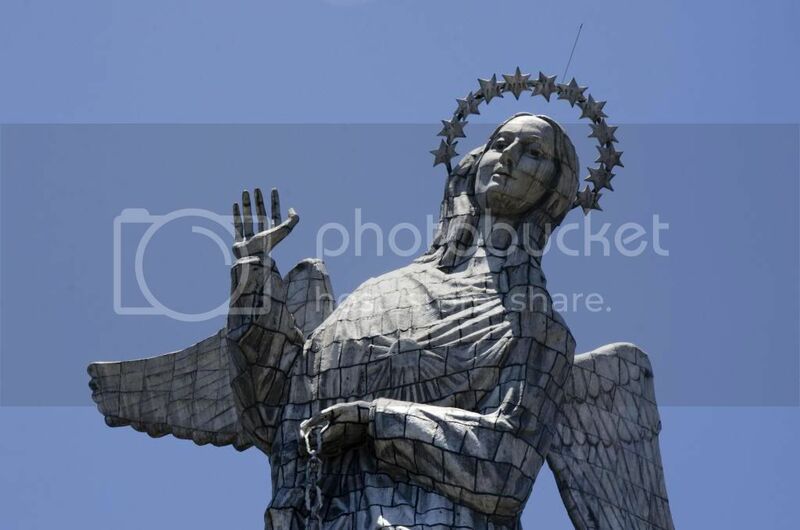 Today, people still visit El Panecillo and they do so to see La Virgin de El Pancillo, a huge statue built in 1955 but not inaugurated until 1975. She is constructed of more than 7000 different pieces. You can see some of the 7000 pieces in this photo. 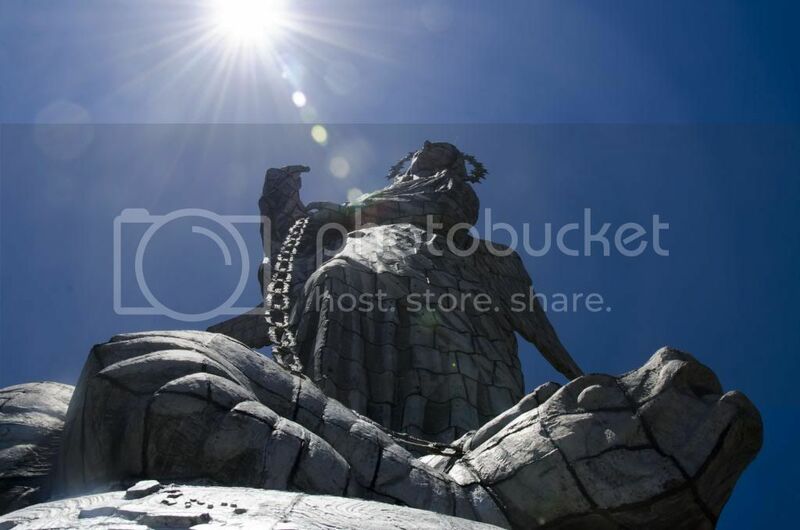 For this, she is sometimes called La Virgin del Apocalipsis or the Virgin of the Apocalypse. 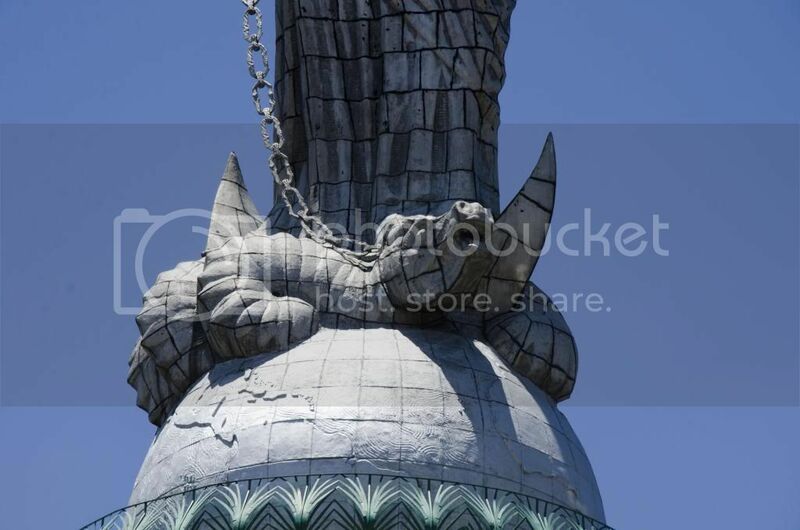 The original sculpture is only 30 centimeters tall but the modern version is a grand 45 meters high. The serpent, chained, beneath the Virgin’s feet. 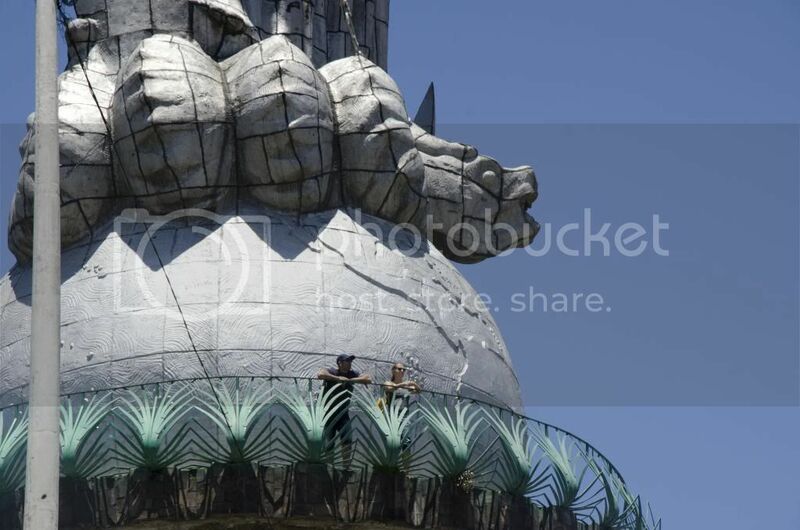 If you venture all the way to the top of the Panecillo, make sure to spend the $1 to enter La Virgen and climb to her viewing platform. 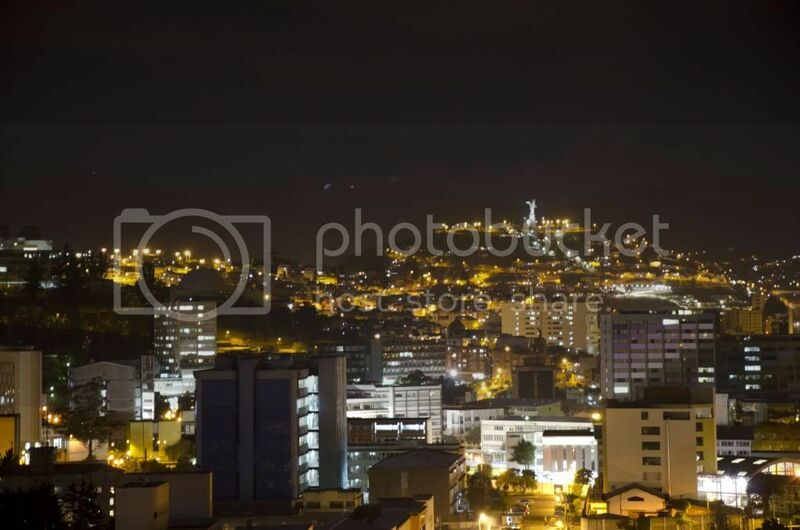 You’ll get a real treat – a grand view of Quito. If you look carefully, you can make out the Plaza de la Indendencia and the Presidential Palace. You can pick out the different churches in the different parts of town. You can see parks dotting the city. And you can see the beautiful mountains that surround it all. And inside the Virgin there is a small museum dedicated to her construction and erection. The photos are all in black and white and the same priest is found in every shot. Inside the statue, you will also find stained-glass versions of many Virgin Marys important to Ecuadorians. 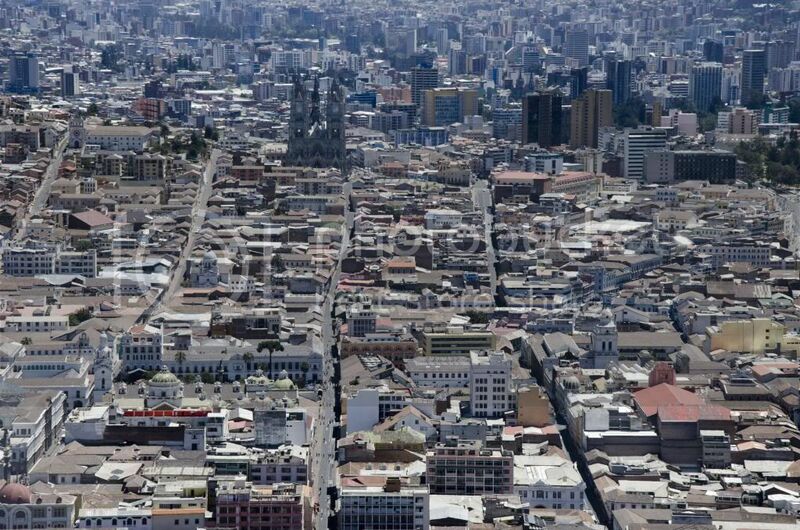 The Historic Center of Quito with business district in the background. There are two main ways to go visit the Virgin. You can climb up the hill; most people start in the the Old Historic Center of Quito, walking up the stone steps that you can find at the end of García Moreno, just past the Museo de la Ciudad. The neighborhood through which the path travels is old and the path is not well cared for. If you decide to walk this way, I will guarantee that you will be warned by locals to hide your camera and to not linger. We walked down this path, not up, after arriving at the top via taxi. And that’s my recommendation… hiking up in altitude is difficult, at best, so this gives you an easy way to the top but as you hike down, you can still see the different views of the city. Just use your common sense and be aware of your surroundings. Don’t hike this trail close to evening time. It’s not worth the worry. And hike with friends. It’s more fun anyway. Close up of the Virgin. Notice the sun beating out of her heart. PreviousSimple Guacamole with the Largest Avocado in the World.